Tostones vs. Maduros (Green Plantains vs. Sweet Plantains) - Whitsons Community Blog Forum! Green plantains have long been a staple in most Latino households everywhere from the Caribbean to Latin America. It’s what I might dare to describe as the equivalent to French Fries…but better, though I may be a little bias having grown up eating plantains alongside every Spanish dish my mother ever created. So…what are green plantains (unripe, starchy) and sweet plantains (over-ripe)? Green plantains are large green bananas that are actually a fruit, but treated like a vegetable. Unlike the yellow “dessert” bananas that are eaten raw, plantains are made for cooking and can be steamed, boiled, grilled, fried or baked! When green plantains are twice fried (see how below), they are called Tostones. Tostones can be served as a savory side dish, appetizer or as a main course when topped with garlic shrimp or seasoned beef. But my favorite way to eat tostones is salted and dipped in a Mojito (garlic sauce - see recipe below). As the plantains ripen, it becomes sweeter and its color changes from green to yellow to black, just like a banana. When the outer skin turns completely black and the inside turns deep yellow and soft, it’s at its sweetest. When the sweet plantains are fried only once they are called Maduros. Maduros in Spanish means “ripe”. Maduros can be served as a side dish, such as with fried eggs and ham. The addition of the maduros makes the ordinary breakfast a special sweet tangy treat. Maduros can also be served as a dessert by adding a scoop of ice-cream, topped with a butter sauce (see recipe below)….OMG! You have got to try it, it’s so dang good! One of the biggest debates in many Latin households is the question that has lead to many heated discussions: “Which do you prefer, Tostones or Maduros?” So I decided to poll my friends on Facebook with the question and the response I got range from “Tostones all the way” and “I can’t decide, I love them both!” But Tostones won out by 65% over Maduros! But don’t take their word for it… try these recipes below and tell me which do you prefer??? Heat a large skillet with an inch of canola until its hot (375 degrees). While the oil is heating up, peel the green plantains and then cut them in 1 – 1.5 inch coins. Plantains can be difficult to peel and takes a little practice and patience to master the technique. Fry the plantains for about 3 minutes or until they are a light golden color and semi-soft. Remove the plantains and drain on a paper towel. Keep the oil heated. When plantains are cool enough to handle, smash them into flat rounds (You can use one of those fancy tostoneras or you can place a plate over the fried plantains and press down). Fry the plantains for a second time in the hot oil for about 3 minutes. They will turn crisp and golden brown. Remove the tostones and drain on a paper towel to remove any excess oil. Add salt to taste. Put garlic and a generous pinch of salt into a mortar. Crush to a rough paste with the pestle, then add cilantro and crush until bruised and fragrant. Add while grinding in a circular motion. Add pepper and adjust seasoning. Dip the tostones into the mojito…and enjoy! Heat a large skillet with an inch of canola oil until its hot (375 degrees). Peel and cut the plantains into coin shapes about ¾ inches thick. Cook the plantains on each side until golden brown (about 5 minutes) and place on a paper towel to remove any excess oil. Combine the melted butter and brown sugar in a bowl; toss the plantains coins in the sauce. Serve the ice cream over the plantains while they are still warm and drizzle any extra butter sauce over the top of the ice cream and prepare for heaven! Jeannette, its pretty good if you like sweets. It's a change from the standard tostones which everyone loves. Having grown up in a Puerto Rican household I as well have grown up eating tostones and maduros. I love them both and can't decide which is "better"....depends on my mood at the time. I have eaten both at one meal. Thanks for using such precise language to describe my favorite fruit! Jackie, I learned so much. Love them both. Will have to give them all a try!! Definately give them both a try! let me know which you prefer. Sounds delicious!!! I will definitely try these recipes out! Thank you Jackie! Sonia: I sometimes add a little vinegar to the garlic dipping sauce to give it a little tangy flavor. Yum - delicious cant wait to try these recipes! I am a chef in a restaurant that serves mexican, nuevo-latino food and I've been looking to upgrade my menu. Thanks for this well written and informative article. Now I have something to impress my boss with. I wouldn't say "a staple in Latino households". My husband is from Guatemala and they don't eat green plantains, only sweet. Also, for them, it's more of a dessert than an appetizer or side dish. Wrong! That's probably your husband that doesn't eat them, no offense. In Guatemala we eat tostones too not just sweet plantains. If you've ever been to Guatemala you can get them anywhere as an appetizer, side dish or snack. They're more popular in the Caribbean and pacific parts of Guatemala but we do eat green plantains too. We also make chips using green plantains. In Puerto Rico we also use the ripe plantain (and also call it amarillos [yellow]) instead of potatoes with in a corned beef stew over rice – some people might add corn also. 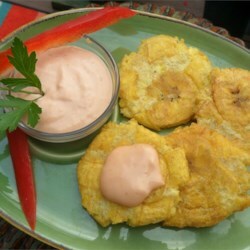 For the tostones a mayo-ketchup dipping sauce is widely popular. Mix mayonnaise and ketchup to taste. I usually add crush garlic into the mix and a few drops of olive oil. I'm going to let mine ripen some then since it in milk. I tried them like that while still green. So I hope ripe will be better.